Polson City Commissioner Dan Morrison, left, Mayor Heather Knutson, and Commissioner John Campbell listen as a community member speaks. 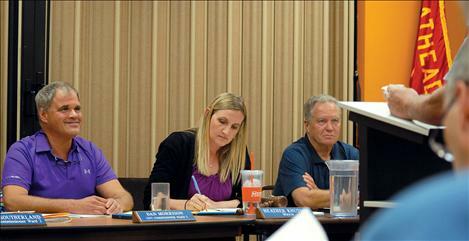 POLSON — The Polson City Commissioners passed both an ordinance to amend the City’s assessment of water charges and approved a resolution to restructure the water system rates and provide for a change in the water and sewer rates at their Sept. 3 meeting. The utility bill for the average customer for water, sewer and stormwater will be $63.48 per month, and will be effective on Nov. 1. Original estimates were as high as $93.51. 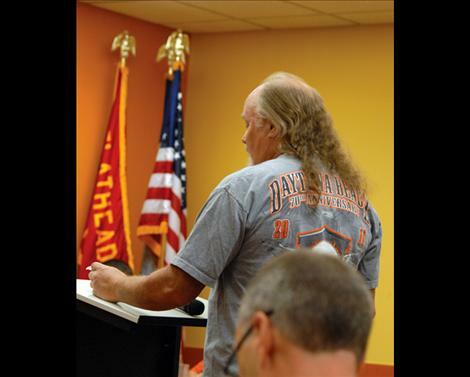 At an open public hearing on Sept. 3 on the proposed water and wastewater rate increase before the City Commission meeting, commissioners heard from about 10 residents. Dennis LaBonty said he applauded the commission for a smaller than 300 percent increase. “You are chewing on it. It’s tough to pare it down,” LaBonty said. He also said he represented four people in his ward who were single households with no way to increase wages. He hoped they won’t move away because of the higher water costs. Bringing up snowbirds, LaBonty said the public should know that snowbirds will pay the fixed cost for water and sewer, which is for the infrastructure, during the off-season. The economic impact will affect levies, charitable contributions and churches, since people only have so much money, LaBonty said. Deborah Moffitt from Lake County Rentals represented the property owners, who may have to raise rents based on water prices. For low-income people, she said Section 8 bases the fair market rent on the cost of the rental unit plus electricity, water, propane and water heating. The fair market rent numbers come out once a year in October, so this year the numbers won’t fairly reflect the changing charges. Moffitt said she’d contact the Montana Department of Commerce to see if something can be done about the problem. Greg Hertz said he looked at the modeling projections by Carl Brown, which show that a 6-percent increase each year was added on top of the 254 percent increase. One of Elsa Duford’s concerns was the changing resolutions. Rates, she said, are not easy for the public to keep up with. The next meeting will be held on Sept. 15 at 7 p.m.